On January 23rd and 24th Tampa Bay hosted its annual innovation trade show at the Amalie Arena called Synapse Summit, and it felt more like a roller-coaster ride than a trade show. It attracted over five thousand attendees in a variety of fields and respective verticals. There were numerous C-Level leaders speaking on panels, start-up founders in breakout discussions, cutting edge state-of-the-art technology on display, and an all-access main stage with celebrities and CEO’s of fortune 500 companies giving their input on the future of innovation and entrepreneurs in Tampa Bay and the greater Florida area. There were many areas of note at the Synapse Summit; however, several key areas did manage to steal the show. In 2019, there will be advances in the medical sciences due to technological breakthroughs which will truly change the world for millions. Several profound examples were on display at Synapse Summit, and after having an opportunity to try them first hand, many were left speechless. Out of the Tampa Bay Wave, an accelerator which has had a monumental impact on developing not only the start-up’s they develop but the Bay Area’s economic growth is a company called Immertec. They have a virtual platform for streamlining training, consulting for interactive situations. Their founder is an impressive individual with a military background and former founder of other successfully launched start-ups. Participants were able to see what an interactive three dimensional training simulation would look like for the surgical training of medical students. Truly, one could feel that we live in a profound era, and I am certainly not as alone as I thought, what a wonderful time to be alive. On the matter of financial technology and data storage, it is difficult to see another star on the horizon brighter or more interesting than blockchain. The effort to decentralize information and transactions has made profound advances and some of the most informed, professional and humble minds were there to discuss where the technology is going and how we could see the global landscape reimagined. The panel on blockchain had an excellent discussion led by the CEO of Pocket Network. Subjects relating to data security, connecting to blockchains and cryptocurrency are where most entrepreneurial luminaries have fixed their gaze since the rise of Bitcoin. From gaming to physical therapy, there has been an eruption of companies seeking to make Virtual Reality and Augmented Reality the platform for delivering a value proposition. 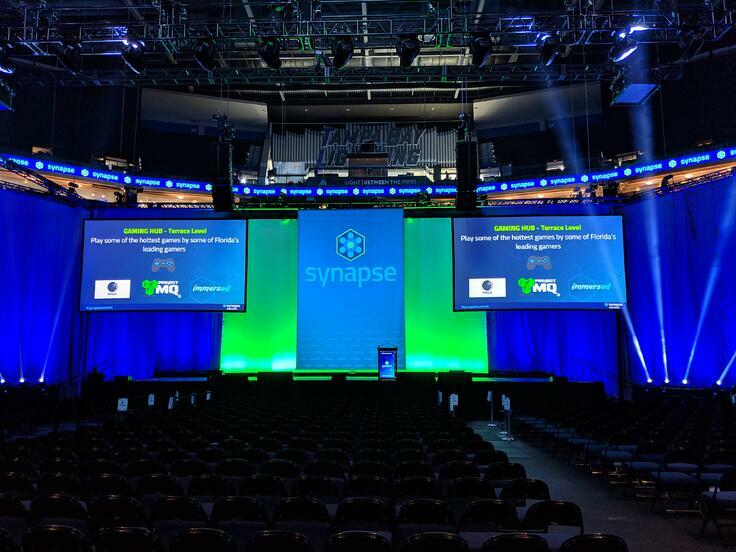 The Synapse Summit had an interactive open world game developed by Helm Systems seeking to enamor onlookers with its product; and after using it first hand, I could honest say it did not disappoint. The fluid movements and realistic world features made the user slip into the magical world of the developer, and time just melted away. I could have spent hours exploring this one. Also on display was the dynamic platform for treating patients in physical therapy with an interactive virtual platform created by Verapy, which has truly reimagined the way patients endure recovery. Gamification of physical therapy is truly an approach which will change the way people, from all walks of life in physical therapy can discover wellness; moreover, forgetting entirely that they are in a clinic or hospital putting their life back together. This area was not as populous as so many others; primarily due to there being such a short list of brilliant minds with the knowledge, expertise and experience to speak concisely as to how the industry has changed with first-hand knowledge of how manufacturing has evolved over the last generation. There was a panel on the second day which was arguably the most outstanding panel for the duration of the event. The CEO of A.R.M., Dr. Byron Clayton and the CEO of Jabil were on the main stage to discuss and add insight to how they see the future of manufacturing. There discussion on how one day we will see a 3D printer in everyone’s home and the designs for what a customer needs will be purchased online, and then emailed to a customer and fabricated right there inside a person’s home. Going to the store or even buying on Amazon will be obsolete. I, and many others around me all seemed to stall at the same time, ticking our imagination with the prospect of making all manner of household items right there in the comfort of our own homes. I can honestly say that it felt like visiting the house and business of tomorrow, and it was even greater to feel that it was all happening right in my backyard. Tampa Bay is becoming a hub for entrepreneurs form start-up to blue-chip to call home and the impact is already being felt. Institutions like the Tampa Bay Wave and leaders like Marc Blumenthal of Synapse, have created an environment of growth and progress which last week sent a very clear message to the state of Florida; this is the new Silicon Valley, and we are proud to call this our home, join us.